When the unthinkable happens, how do you respond? The most natural response is to just act on whatever feels good in the moment. There are many responses to discovering that your partner has cheated, and all of them feel valid in the moment. However, in the days and weeks after the discovery, some reactions hinder healing – whether the choice is made to stay together or separate. I would like to advise you of a few things NOT to do after discovering that your mate had an affair. (Take our advice. We see these happen frequently…and it’s never helpful). After discovering the affair, it may seem natural for you to want to talk to others about it, whether it is to turn to others for support or to embarrass your partner. However, there is a lot of uncertainty surrounding your relationship. There is no clear answer if you are going to stay together, break up, hate each other, love each other, etc. If there is any chance of repair in this relationship, it is important to make the best decisions now in order to keep from hindering the healing process. Imagine six months to a year from now: you and your partner have worked hard to repair your relationship, but now your close friends and family have a lot of hate and resentment. This makes the road to reconciliation far more difficult. Once some time has passed and decisions for the state of your relationship has been made, come up with a plan of what to share and with whom. Especially what and when you are going to tell your parents, children, siblings, friends, neighbors, and co-workers. The exception to this is a therapist or physician, who is bound by laws of confidentiality and will protect your privacy while helping to guide you through your next steps of your mental and physical health. I get it, you’re hurt. Your first reaction is to get angry, and want revenge. However, putting demeaning comments of your partner or spouse on social media, for the world to see, is not helpful. Remember, social media lives forever. Once you put it out there, you can never get it back (even if you delete it from your timeline or feed). It is very important to protect yourself and your partner in what you put on social media. When you are calmer, you will likely regret what was posted on social media. But your 2,754 friends will remember that your partner had an affair, and all the nasty mud-slinging that occurred between the two of you for the entire world to see. *Having an affair of your own in retaliation. *Changing the locks on your house after kicking your partner out. *Draining the joint bank account and hiding the money. The healing process after an affair takes time, patience and a lot of difficult, emotional work. Some of these quick, large decisions can make the healing process more difficult than it already is and can mask the real issues. Take the time to take care of yourself emotionally so that you can clearly think through large decisions. The first thing that needs to happen on the road to recovery is that your partner needs to take 100% of the responsibility for that act of betrayal toward you. Yes, there may be other relationship issues that need to be addressed, but in the moment of discovery, those are secondary. If your partner does not accept full responsibility, then it is very difficult to assure that it will not happen again. If the partner can blame someone else (their affair partner) then it becomes that person’s fault, and then it becomes an uncontrollable action that can be repeated. After discovering the affair, most people say they hate the “other person.” However, your reaction to that person could lead to behavior that may cause more harm for you than good. Many people consider finding the affair partner, confronting him/her, and perhaps “outing” them by telling their spouse or significant other about the affair. Other hurt parties find the affair partner on social media and “stalk” their social media pages to find out more information, or begin obsessing about this person, wondering, “why did he/she choose this person? What do they have that I don’t?” These thoughts or actions do not help you or your relationship–they only make things worse. Many people are hyper focused on the other affair partner because that is a person or factor out of their control. Remember to only focus on yourself, your partner and your relationship. You have been betrayed. You have been hurt. This is not your fault. You are not to blame. Have you been perfect in your relationship? No, no one has, but in this moment, your mistakes are not an excuse for your partner’s betrayal. Protect your sanity in this moment and repeat this after me: “It is NOT my fault my partner betrayed me.” Repeat this as many times as it takes until you can believe it. This is the time to heal and help yourself begin to work toward making the best decisions for your family. When your relationship has been through the betrayal and hurt that comes with an affair, it takes professional help to properly heal and move forward with life. I would love to tell you that you can do this on your own, but for lasting recovery, professional help is almost always necessary. We can help. At Family Therapy Associates, we specialize in infidelity recovery. We would be honored to help you not only survive an affair but thrive in your relationship. Our clinicians are trained in evidence-based practices (models that are proven to work) that will help guide you on a path to recovery. You don’t have to work through this alone. If you have discovered an affair, give us a call or schedule an appointment today. 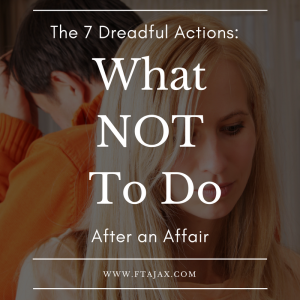 Check out our other related article, 9 Tips to Move Forward After the Affair.